A first-rate blending of true-crime, character study, and history [that] kept me riveted from the first word to the last. Combining history, mystery, detection, and a courtroom drama as timely as any in today’s headlines, the 1831 murder of Dr. Chapman rocked the young American nation and led to a scandalous dual trial that raised haunting questions of sexism and racism. In THE MURDER OF DR. CHAPMAN: The Legendary Trials of Lucretia Chapman and Her Lover (Harpercollins, January 23, 2004), acclaimed journalist Linda Wolfe skillfully braids trial transcripts, intimate love letters, and period recollections into a compelling historical thriller that brings to life a forgotten piece of American history and reads with a remarkable contemporary feel. “Fascinating....Wolfe has always been a keen observer of contemporary true crime; here she has delved deeper into history to disinter a quintessential con man who cut a wide swath along the eastern seaboard." "With her customary reportorial skill, Linda Wolfe gives us a ringside seat at what must surely have been one of the most fascinating murder trials in 19th century America – and one that foreshadows the media circuses of our own time. At the center, as lurid and incongruous a pair of lover-antagonists as you could want, are a married woman educator of intelligence and apparent probity and the fatally charming Cuban bounder for whom she risks everything. The third character in this swirling pageant, changing with the wind, is the ghoulish, gullible, and fickle American public. A wonderfully racy and illuminating slice of pre-tabloid tabloid history." 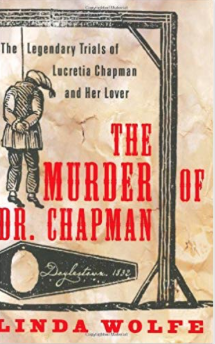 "The Murder of Dr. Chapman is an incredible tale brilliantly told. To say I couldn't put it down is an understatement." "The Murder of Dr. Chapman reads like the best sort of literary thriller. Linda Wolfe's meticulous account of this strange murder belongs on the shelf beside Victoria Lincoln's classic account of the Lizzie Borden case. Connoisseurs of sensational trials, from OJ Simpson to Claus Von Bulow, will surely not want to miss this one, which was made for Court TV, had it existed in the nineteenth century!" "An incredible story of justice and injustice in early America, from a writer who knows how to tell a compelling story while maintaining a respect for historical accuracy."